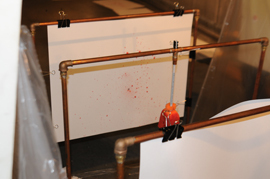 The shooting experiment illustrates the concept that a bullet striking a blood source and provided the blood source does not have an exterior barrier or membrane, blood will spray out. 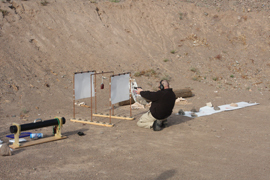 To relate this experiment to the real world, someone is shot in the body that is not covered by clothing. Blood spays back to the shooter and forward with the bullet. Poster boards vary in distance from the blood source to catch this spatter as witness to how far the droplets can travel and what size of droplet is created.